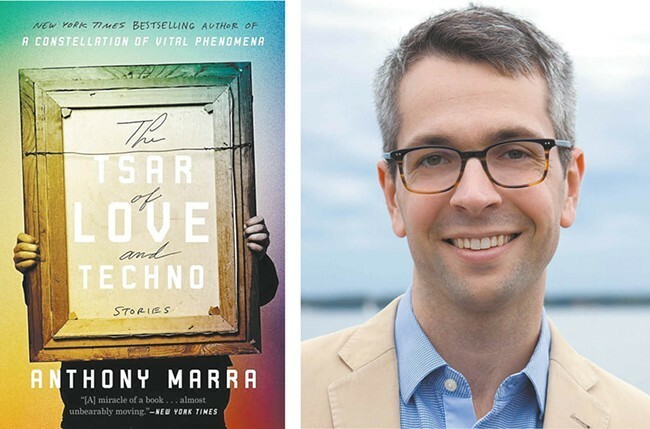 On Wednesday evening, friends of the Spokane County Library District and fans of this year’s Spokane is Reading featured author Anthony Marra met at the Moran Prairie branch to see him in conversation with local author Jess Walter. “I don’t think Marra is a Russian surname,” Walter joked at one point, referring to Marra’s choice to focus on the former Soviet Union in his recent work. The following conversation wove in and out of Marra’s writing and into his life, occasionally revealing a surprising frankness regarding his audacity in writing about something he isn’t personally attached to. The special limited attendance event (only 25 spots were available) revolved mostly around Marra’s last two books, his short story collection chosen as this year's Spokane is Reading book, The Tsar of Love and Techno, and his novel A Constellation of Vital Phenomenon. While in college, Marra said, he fell in love with the “wealth of Russian literature,” and became fascinated with absurd stories that evolved out of the broken systems of the Soviet Union. Moments from his books, such as the painting censor in Tsar, are real historical details, a result of years of research on Russian history. Marra spoke at length about the moments in his Russian travels which impacted the books. In response to a question from Walter about the use of humor in the book, Marra recalled his Russian friends using humor to diffuse legitimate fear, joking about threats to throw him in the trunk of a car to alleviate his fear of being kidnapped. Perhaps my favorite part of the conversation was something that the two initially tried to shy away from; Walters started the night with an anecdote about “shut up” talk, which is what his wife calls intense literary talk. It was truly a pleasure listening to the two men, both incredible craftsmen, opine on what makes for effective structure, what the difference is between short stories and novels, the undervalued role of humor, the “audacity of ignorance” and so much more. Ultimately the conversation returned to audience questions, and folks were able to ask Marra about particular characters and moments from the books. Though Marra said “it’s never good to interpret your own work,” he was gracious and patient, and attentively gave each of his explanations. Marra and Walter both assured the small audience that each of the coming events happening this Thursday will be different, and I would highly recommend going to see Marra speak. The free public events today are at 1 pm at the Spokane Valley Event Center, and at 7 pm at the Bing Crosby Theater.